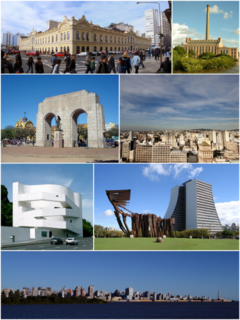 This name uses Spanish naming customs: the first or paternal family name is Sorondo and the second or maternal family name is Amaro. Gonzalo Sorondo Amaro (born October 9, 1979 in Montevideo) is a Uruguayan footballer who last played for Defensor. He has earned 27 caps for his country, and played for them at the 2002 FIFA World Cup. Sorondo began his career with Uruguayan club Defensor Sporting Club, moving to Inter Milan in 2001. By 2003 he was on loan to Belgian club Standard Liège. Crystal Palace took him on loan in August 2004 where he played in the Premier League. A year later another loan, this time to Charlton, was confirmed in July 2005 after he obtained a work permit. 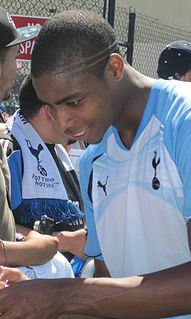 At the summer of 2006 he became a free agent, and signed a permanent contract with Charlton. 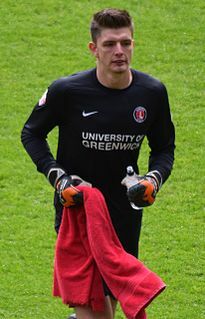 Sorondo was released by Charlton Athletic alongside compatriot Omar Pouso in February 2007 after just one Premier League appearance. He returned to Defensor. Football Club Internazionale Milano, commonly referred to as Internazionale or simply Inter and colloquially known as Inter Milan outside Italy, is an Italian professional football club based in Milan, Lombardy. Inter is the only Italian club to have never been relegated from the top flight. Royal Standard de Liège, commonly referred to as Standard Liège, is a Belgian football club from the city of Liège. They are one of the most successful clubs in Belgium, having won the Belgian league on ten occasions, most recently in 2007–08 and 2008–09. They have been in the top flight without interruption since 1921, longer than any other Belgian side. They have also won eight Belgian Cups, and in 1981–82 they reached the final of the European Cup Winners' Cup, which they lost 2–1 against Barcelona. Crystal Palace Football Club is an English professional football club based in Selhurst, South London, that competes in the Premier League, the highest level of English football. They were founded in 1905 at the famous Crystal Palace Exhibition building and played their home games at the FA Cup Final stadium situated inside the historic Palace grounds. The club were forced to leave the Palace in 1915 due to the outbreak of the First World War, and played at Herne Hill Velodrome and the Nest until 1924, when they moved to their current home at Selhurst Park. Grêmio Foot-Ball Porto Alegrense, commonly known as Grêmio, is a Brazilian professional football club based in Porto Alegre, Rio Grande do Sul. The club plays in the Campeonato Brasileiro Série A, the top tier of the Brazilian football league system, and the Campeonato Gaúcho, Rio Grande do Sul's top state league. The club was founded in 1903. 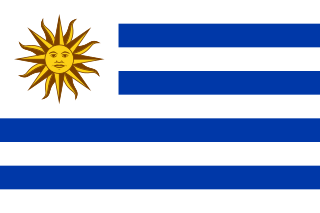 Sorondo played at the 1999 FIFA World Youth Championship, in which Uruguay finished in 4th. The 1999 FIFA World Youth Championship took place in Nigeria between 3 April and 24 April 1999. This was the 12th edition of the tournament. He was a regular member of the Uruguay national team, making his debut against Colombia, the August 15, 2000, and played for his country in the 2002 FIFA World Cup, but has consistently been dropped in recent years, due to injuries and limited league appearances. Diego Forlán Corazo is a Uruguayan professional footballer who plays as a forward. A prolific goal scorer, he is regarded as one of the greatest Uruguayan players of all time. At club level, Forlán is a two-time winner of both the Pichichi Trophy and the European Golden Shoe. With Uruguay, he had huge individual success at the 2010 World Cup receiving the Golden Ball, the joint Top Scorer award, the Goal of the Tournament award and being named in the Dream Team. Thomas James Soares is an English footballer who plays for AFC Wimbledon. Jerome William Thomas is an English former footballer who played predominantly as a left-winger. He scored 25 goals in 292 league and cup appearances throughout a 16-year professional career in the English Football League and Premier League. Mauricio Ricardo Pinilla Ferrera is a Chilean professional footballer who plays for Coquimbo Unido as a striker. Leon Terence Anthony Cort is a former footballer who played as a defender. He is the younger brother of Carl Cort and the older half-brother of Ruben Loftus-Cheek. Philippe Mexès is a French former professional footballer who played as a centre back. He represented Auxerre, Roma and Milan at club level. At international level, he played for the French national team. Omar Heber Pouso Osores is a Uruguayan footballer who plays as a midfielder for Club de Gimnasia y Esgrima La Plata. Gonzalo Alejandro Jara Reyes is a Chilean professional footballer who currently plays for Estudiantes de La Plata. He is a versatile defender and can play in either a full-back role or as a centre-back. Mauro Matías Zárate is an Argentine footballer who plays as a forward for Boca Juniors. Diego Roberto Godín Leal is a Uruguayan professional footballer who captains both Spanish club Atlético Madrid and the Uruguay national team as a central defender. Álvaro Rafael González Luengo, nicknamed "Tata" is a Uruguayan professional footballer who plays for Defensor Sporting as a midfielder. A Uruguayan more than 70 occacions, he represented his nation for one World Cup and three Copa America tournaments. Álvaro Daniel Pereira Barragán is a Uruguayan footballer who plays for Club Nacional de Football on loan from Argentine club Estudiantes de La Plata. Mainly a left back, he can perform equally as a left midfielder. Jonathan Chiedozie Obika is an English professional footballer who plays for Oxford United as a striker. During the 2004–05 English football season, Crystal Palace competed in the FA Premier League, following promotion from the First Division the previous season. Thomas Christopher Ince is an English professional footballer who plays as either an attacking midfielder, winger or forward for Championship club Stoke City. 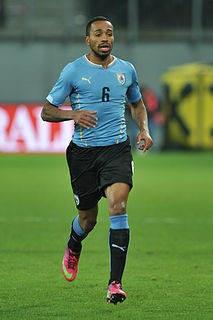 Matías Vecino Falero is a Uruguayan professional footballer who plays as a midfielder for Italian club Inter Milan and Uruguayan national team. Diego Sebastián Laxalt Suárez is a Uruguayan professional footballer who currently plays as a left back or attacking midfielder for Serie A club Milan. He is a youth exponent from Defensor Sporting, having passed through the youth ranks in July 2012. Nicholas David Pope is an English professional footballer who plays as a goalkeeper for Premier League club Burnley and the English national team. Diego Poyet González is a professional footballer who plays as a midfielder. His father is former Uruguay international footballer Gus Poyet. The 2014–15 season was Cardiff City Football Club's 98th season playing professional football and the 87th in the Football League. Cardiff were relegated from the Premier League during the last season, meaning an instant return to the Championship, the second tier in English football. 1 2 "Uruguaio Sorondo é naturalizado cidadão brasileiro" (in Portuguese). Globo Esporte. September 3, 2009. Retrieved September 3, 2009. ↑ "Sorondo: Ecco tutte le foto della presentazione ad appiano". Inter Milan official Website (in Italian). 2 October 2001. Retrieved 31 August 2004. ↑ "Palace sign Inter duo". BBC. 31 August 2004. Retrieved 21 June 2014. ↑ "Charlton complete Sorondo signing". BBC. 14 July 2005. Retrieved 21 June 2014. ↑ "Charlton agree deal for Sorondo". BBC. 12 May 2006. Retrieved 21 June 2014. ↑ "Charlton release Uruguayan pair". BBC. 20 February 2007. Retrieved 21 June 2014. ↑ "Charlton release duo". Sky Sports. 20 February 2007. Retrieved 21 June 2014.